Croissants and smoothies can be ‘healthy’ right? I am not a fan of processed food in any way shape or form. That’s not to say I don’t have it occasionally. I buy smoothies, I sometimes eat bread and I have cheese on my veges. But it’s the two guys in my family who request snacks and I struggle to find really healthy ones, other than cranberries, fruit, crackers and quinoa bites (which they loathe!). So recently I’ve been looking for a little snack for my son and my husband to have in their packed lunch boxes. ‘You give us so much fruit!’ they say. My husband is looking for a quick, easy, convenient breakfast that is no-mess at his desk. And for him, Bauli croissants have been a winner. Bauli Mini Croissants are, he says, irresistible. 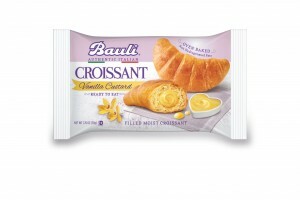 The Bauli croissants are a smaller, bite-sized snack than the usual croissant. A favorite snack in Italy, the Mini Croissants come in handy, easy-to-pack bags which make them ideal for a snack at home or on-the-go, just as my husband requested. And I’ve found success in the kid’s packed lunch too – Mini Croissants are one of those kid-friendly, guilt-free snacks that I don’t feel bad about feeding my son. I make a lot of smoothies at home, and some of them get the thumbs up from my son, and some of them get a shake of the head. But when we got his mouth round a Bolthouse Smoothie from the new kids’ range his eyes lit up. ‘Let me see the sugar content.’ I said, skeptical that something that he was so delighted about would not have added sugar. None. No added sugar. Strawberry and banana is his favorite. Since the smoothies were such a success, I tried him on the fruit tubes. Again, much whooping about how delicious they were, especially the Blueberry meets Raspberry. Result! And no high fructose corn syrup – hooray! And no preservatives. This gets better! But the really big test was the snack pack of carrots. Too often he’s pushed his plate away with the carrots on. Oh, I mush them and pulp them into stews so he has no idea, but he seems really against carrots. ‘Try these,’ I say. ‘They’re different.’ He sighs. ‘Okay,’ he replies, and tentatively bites into one. I see a small smile and a nod of the head. I take that to mean they’re good. I try one. Boy, they are good! The clever clogs at Bolthouse have added a tiny bit of seasoning to these carrots – lime and chili on one bag, and ranch seasoning on the other. My son munches them down. I’ve found three excellent snacks for camp, school and playtime – and for me too! Thanks Bolthouse 🙂 .